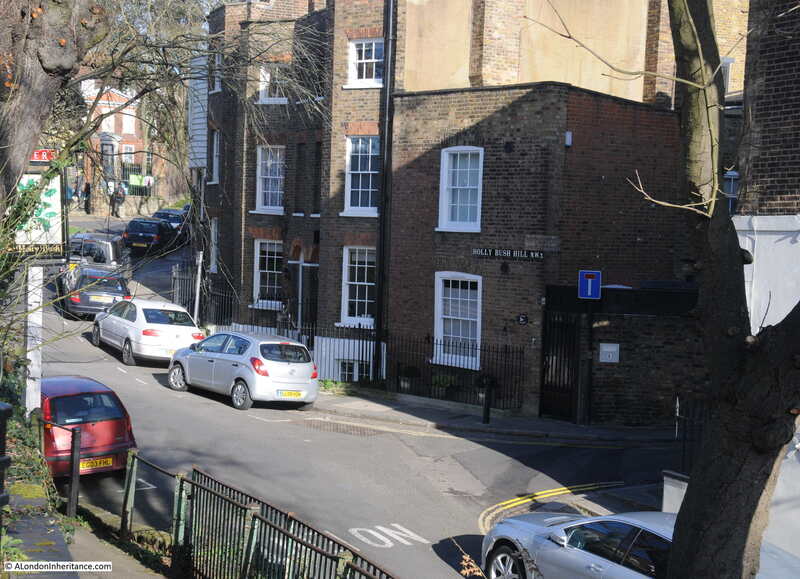 After visiting the Chalybeate Well in Hampstead which I featured in my post of two weeks ago, I stayed in Hampstead and walked to the other side of Heath Street to visit Holly Bush Hill. Sixty seven years ago in 1949, my father took the following photo looking up Holly Bush Hill from the walkway that leads up to Mount Vernon. And in 2016, Holly Bush Hill looks much the same. Turning to the right in 1949, the view looking down from Holly Bush Hill. And the same view in 2016. As with many of the side streets in Hampstead, there has been very little change over many decades. Both photos highlight the major change since 1949 which is how much cars have taken over the streets. 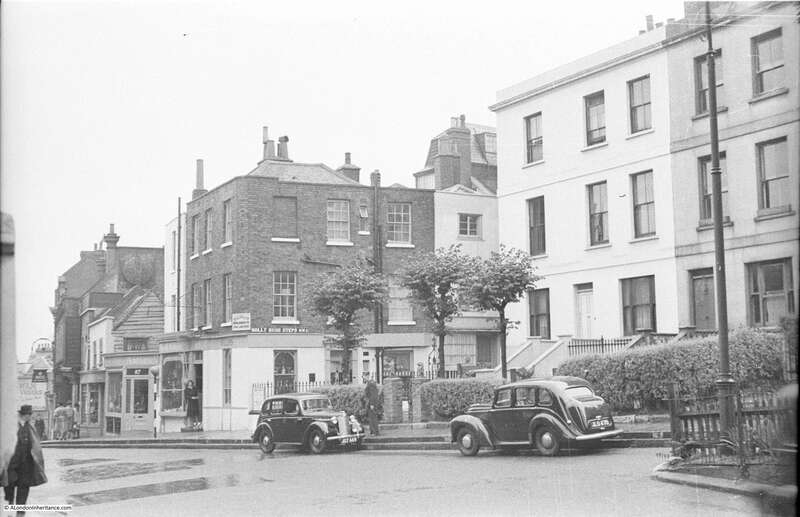 In 1949 there were very few cars to be seen and street parking was minimal, however in 2016 cars are everywhere and the side streets are lined with parked cars. I cannot find the origin of the name Holly Bush Hill. Many of the streets in this area use the name Holly, for example Holly Bush Vale and Holly Mount so there must be an original local meaning, perhaps the growth of holly bushes at the top of the hill. Other possible sources of the name refer to the local pub, The Holly Bush. This pub name has several possible meanings including the use of the Holly Bush by the Romans during their Saturnalia celebrations and also the custom of hanging a green branch or bush over the door of a building that sold wines and beers for advertisement. 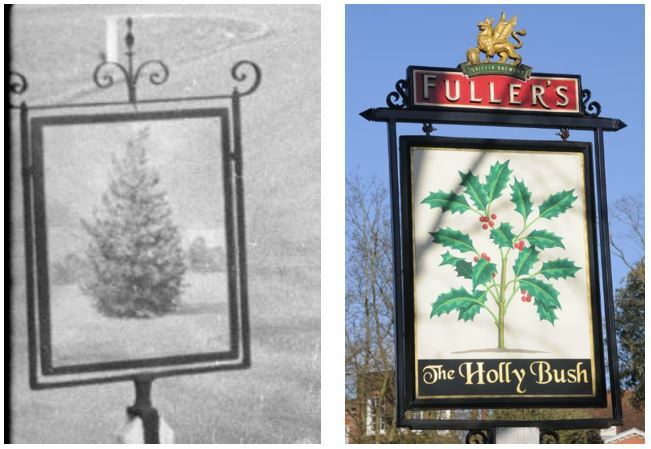 Whatever the original source of the name, the holy on the pub sign has reduced over the years from a full holly bush in 1949 down to a sprig of holly in 2016. Holly Bush Hill was not the original name of the street. George W. Potter in Hampstead Wells – A Short History Of Their Rise And Decline published in 1907 states that the original name was Cloth Hill “no doubt because it was anciently used as a drying or bleaching ground”. George Potter records that before becoming a very fashionable area, Hampstead was the location for a large number of laundry businesses set-up to serve London. 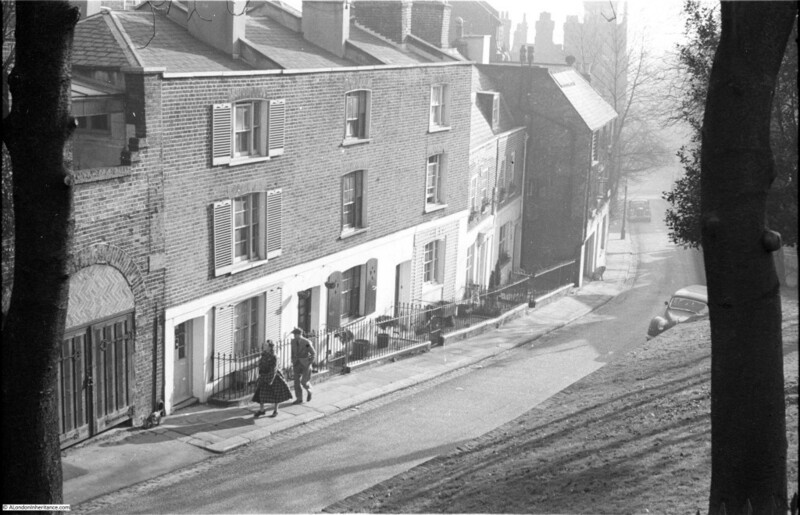 Hampstead was a perfect location due to the availability of a large number of springs with a good supply of clean water. No doubt the windy heights of Hampstead also helped with drying. In the first 1949 photo there is a pub sign on the left and on the wall on the right the brewery name Benskins. This refers to the pub “The Holly Bush” which, as can be seen by the 2016 pub sign, is still in existence and down the side street Holly Mount. The Holly Bush is a lovely old pub, built-in 1643 and a grade II listed building, one of the London locations that Dr. Johnson and Boswell drank in. Today it is a perfect stop after a walk around Hampstead. In the top photo, look just along the street to the buildings on the right, these are also much the same. George Romney was a society portraitist, completing portraits of many prominent people of the time. A very skillful draughtsman, initially he did not have the confidence for major works of art, however in 1782 he met Emma Hart, the future Lady Emma Hamilton who became Lord Nelson’s mistress. At the time of Romney’s meeting with Emma Hart, she was the mistress of Charles Greville who took her to Romney to have her portrait painted. Romney was fascinated by her, and she became his “artist’s muse”, sitting for him many times and featuring in a large number of Romney’s works. 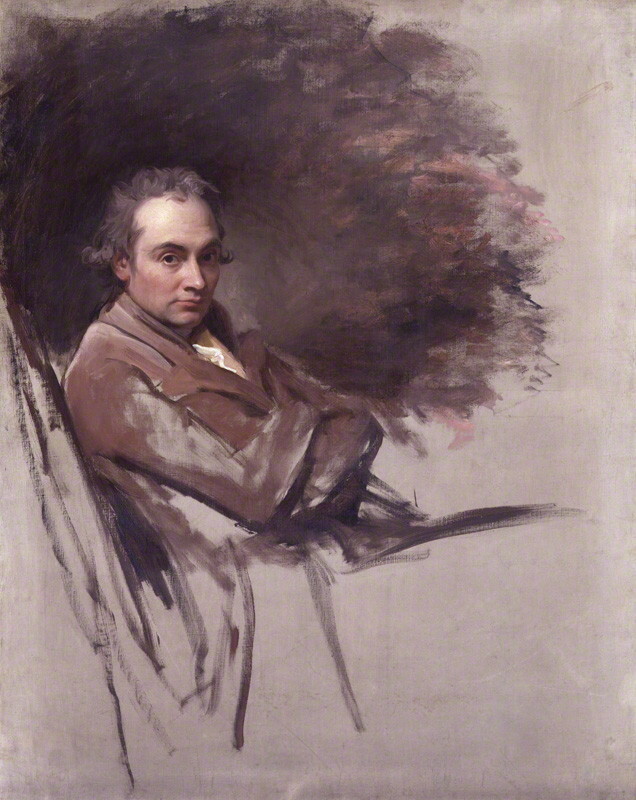 Self portrait of George Romney, oil on canvas, 1784. 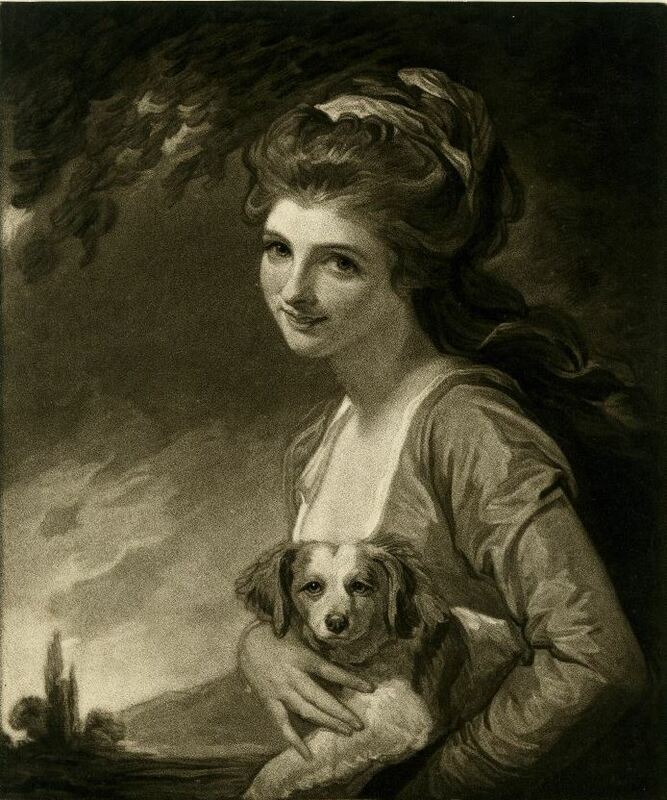 One of George Romney’s drawings of Lady Hamilton. 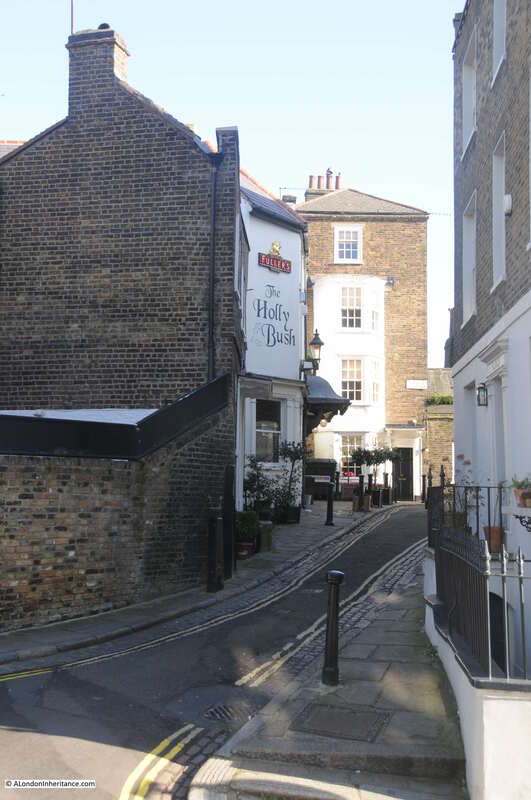 On the assumption that you may have stopped for a drink in The Holly Bush, when you come out, turn left along Holly Mount, then down Holly Bush Steps to Heath Street. Cross over, walk a short distance up Heath Street then stop , turn round and look back. This was the view in 1949. And in 2016 (my apologies for the quality of the photo, it was a very sunny day and despite waiting for the sun to drop behind the buildings it still presented some contrast problems). 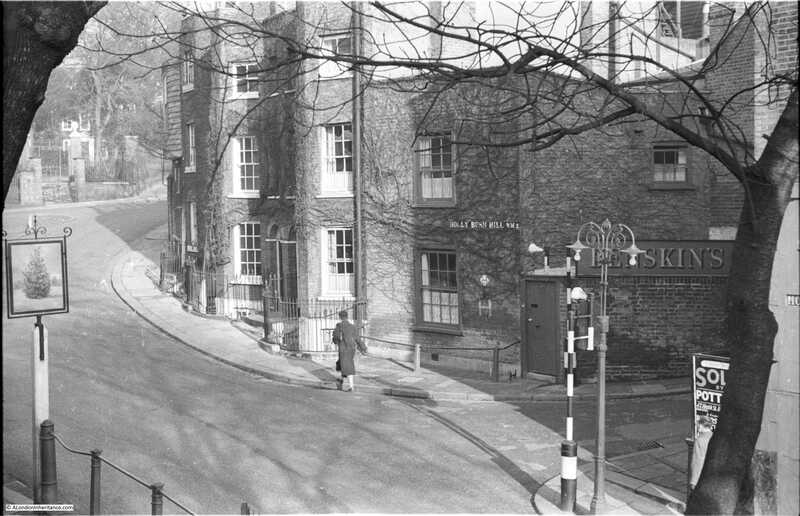 The entrance to Holly Bush Steps is just behind the furthest car in the 1949 photo. Heath Street is an incredibly busy road and despite waiting for almost half an hour there was not a break in the traffic, however if you ignore the cars and focus on the buildings, the scene is almost exactly the same. I am sure that the trees in front of the white building on the right are the same. 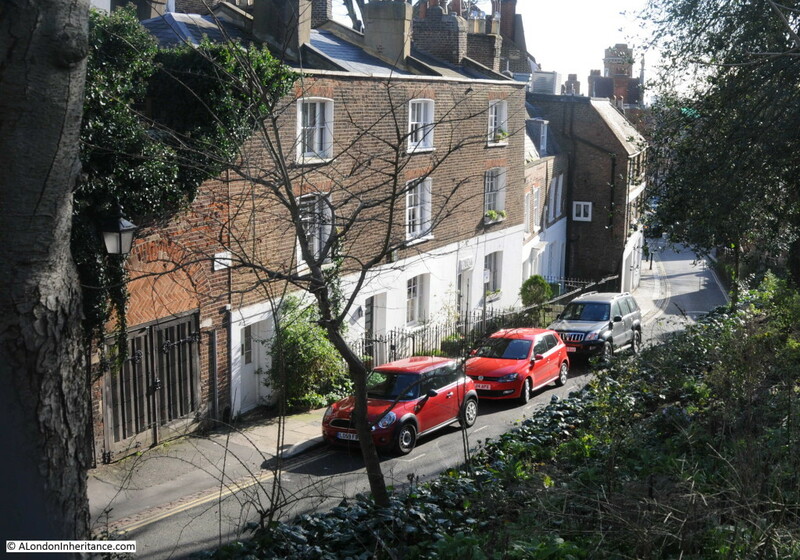 The side streets of Hampstead have changed very little over the years. Take away the cars and I suspect George Romney would not find too many differences if he was to return to his house and studio. This entry was posted in London Streets and tagged George Romney, Hampstead, Holly Bush Hill, Lady Emma Hamilton, The Holly Bush on February 28, 2016 by admin. I don’t really know Hampstead and it has always carried the image of poshness. But it was a village and before the gentrification of the last half century or more there was a social mix. My great-grandmother was born about a mile to the south of the Holly Bush off Haverstock Hill. Her parents had arrived in Hampstead the previous year from Suffolk where her father had been an agricultural labourer. What was he doing in Hampstead? Quite simply he became a gardener – transferable skills – and it is evident that he brought Suffolk ways with him as he had 20 chickens stolen from his hen coops in 1884. It speaks volumes that he could afford to rent a house there at that time (1880 onwards). That social mix has now been eradicated in places like Hampstead. 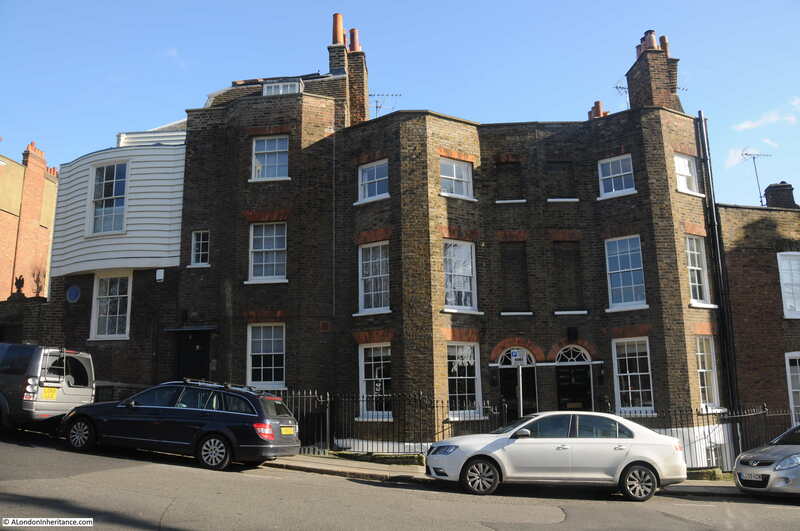 I think that much has been lost in the process and the London villages have become less characterful as a result (I speak with personal knowledge of Wimbledon Village). As usual the before and after photos are interesting even where there are few changes. 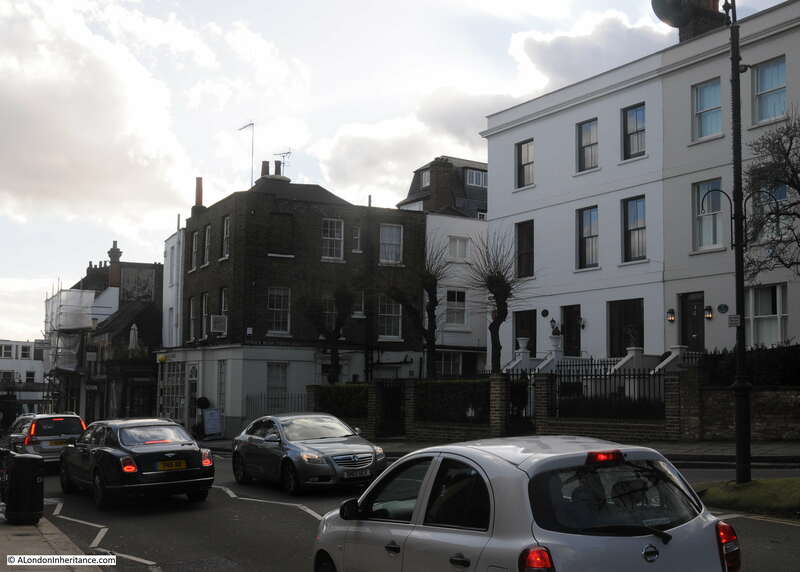 In the late 80s I was fortunate to live in Hampstead, in a rented flat that was incredibly cheap, even for the times. My husband and I used to wander up to the Holly Bush regularly in the evenings and it was always busy and friendly. I have been back since and found it much the same, the small rooms and the dark walls very comforting. Hampstead is now completely out of the reach of those who are not very well off, which is a shame because its charm was related to the rackety air that still clung to it, haunt of artists and poets. The flat we used to rent at the top of a large house on Parliament Hill is now reintegrated into an entire house, completely renovated and updated. I cannot imagine how much it costs to live there now as the house is worth over £4 million. Oh well. Glad I had my three years there. Thanks for the comment Annie. Agree regarding the Holly Bush, it has not changed that much over the years and I hope it remains the same into the future, always a good stopping point after or during a walk. It must have been a good experience living in Hampstead, but as you say prices just seem to be getting higher and higher in Hampstead as in much of London. I have just learned that my Grandfather (who I never knew) won £20,000 on the football pools some time after the First World War and moved out of the East End and bought the Holly Bush with the money. He had separated from my Grandmother and, apparently, squandered his profits on booze and women. I wonder if you have any record of him owning the pub. His name was James Cole (possibly James Ormand Cole).